I bought some of these a while back...and my family LOVES them! 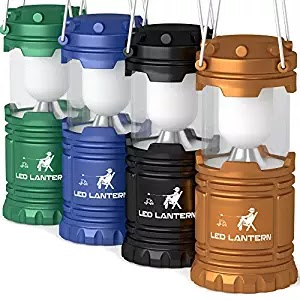 Head over to get this MalloMe LED Camping Lantern Flashlights Camping Gear Accessories Equipment 4-Pack Gift Set for ONLY $15.99! These high-powered LED travel lanterns boast 146 lumens each to give you unbeatable illumination around your campground, tent, cabin or backyard. And because the collapsible design lets you adjust how much light is distributed, you can create the ideal amount of light for working, cooking, reading, or even fishing in the dark. When you need more reliable light than the traditional campfire, choose MalloMe LED lanterns.